LAWRENCE – At the prospect of meeting a "real" shaman in Seoul for the first time, Kyoim Yun was almost overcome by anxiety. Her idea that shamans possess mysterious power and were not quite at home in the modern world both fascinated and intimidated her. What she saw was a series of hardball negotiations between the shaman and client as well as between deities and humans. The intense bargaining caught Yun, an assistant professor of East Asian languages and culture at the University of Kansas, by surprise. It also sent her down a new research path. For more than a decade, Yun has been traveling to Cheju (Jeju) Island, a popular tourist destination off Korea’s southern coast, to study shamanic practice. Through her historical and ethnographic research, she learned that economic issues have been at the heart of shamanic practice for centuries. 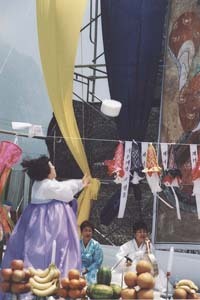 Her book “Ritual Economy: Contingencies of Value in Shamanic Practice on Cheju Island, South Korea” is under contract with the University of Washington Press and will be published in 2015. The cost for a daylong ritual, which involves chanting, singing, praying and dancing, varies. Cheju shamans with a good reputation would ask about $1,000, not including any of the offerings that will be made. 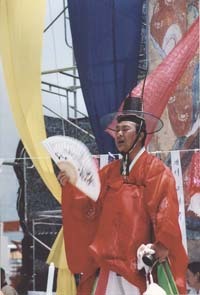 Yun notes that typically three or four shamans share the fee. Shamans are paid in advance, so clients run the risk of paying before they know whether the ritual has worked or was done correctly. Incorrectly performed rituals bring bad luck. Part of a shaman’s work is reciting stories of their deities and holding a séance to contact ancestors. Compared to the Korean mainland, Confucianism came late to the island, allowing for stronger ties to the indigenous religion that dates back centuries. Arriving on Cheju after having been exiled from the mainland or demoted, Confucian scholars of the Chosŏn dynasty observed the island’s flourishing shamanic cult as a marker of cultural backwardness. One fervent magistrate left a record of the destruction of 129 shamanic shrines that took place in 1702 during his tenure. Despite these attempts to wipe it out, shamanism is still widely practiced on the island today. People hire shamans to ensure security in life and to avoid misfortune. Shamans are called upon by businessmen in financial trouble, by people who are ill who couldn’t be cured by doctors and by parents seeking to improve a child’s well-being. Diving women have been key devotees of shamanic rituals. They collectively harvest sea products in the nearby ocean purposefully with old-fashioned diving equipment to maintain sustainability of the sea bed. They sponsor rituals every year in order to secure safety and bountiful harvest from the sea. Known as an exotic location, the volcanic island of Cheju has attracted Korean honeymooners and Japanese vacationers for decades and, recently, tourists from all over the world. Local and national stakeholders made a concerted effort to capitalize on Cheju’s cultural resources as well as its spectacular natural beauty by earning global recognition. Shamanic rituals were staged for the 2000 World Cup, and UNESCO recognized one communal ritual from the island as intangible cultural heritage of the world in the fall of 2009. “The ritual economy is part of the big economy now and not just the household economy,” Yun said.